IDW Publishing releases its first annual for the Star Wars Adventure series. 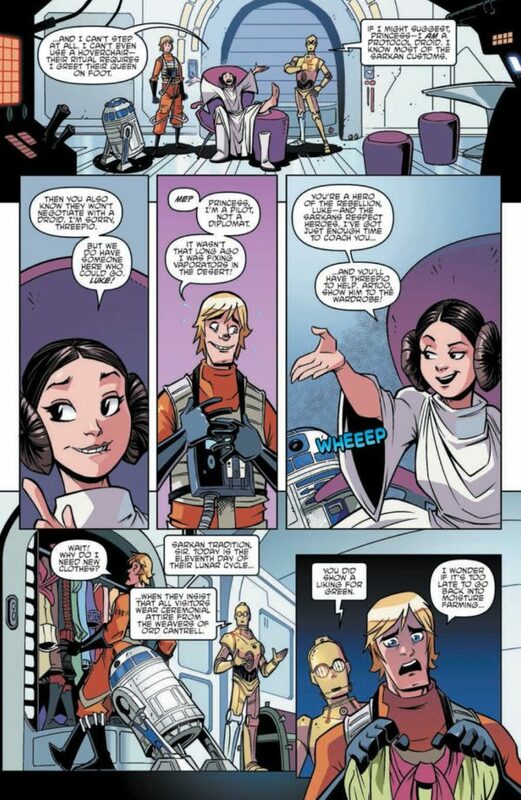 Justly so we are give 28 pages of a story from the early days of Luke and Leia. The issue takes place shortly after the destruction of the Death Star. Our soon to be twins have been sent to Sarka on a diplomatic mission to gain hopefully allies against the Empire. The story has some strange turn of events that are result of Luke’s quality piloting. The Sarkarans are a race of people who happen to very specific about their culture and the way things are done. Our authors decide to Luke in the diplomatic seat, which probably isn’t the best choice. It works as a great fish out of water situation. There’s is a nice subplot that helps the story move along and allow Leia back into the mix. It’s always refreshing to get a Luke and Leia story. C3PO and R2D2 are also included in the plot’s adventure: They do what they do to help resolve the story. Jon Sommariva’s art is fun and cartoony as always. He does a great job of getting the likeness across. The layouts are quality and help move the eye pleasingly through the book. The book’s back up story is a rare treat. From the bowels of Star Wars lore comes Jaxxon. A character that is almost unloved as Jar Jar Binks. George Lucas never wanted to see the character in print again, after his brief appearance in the original Marvel run in the 70’s. Jaxxon’s tale/tail is entertaining despite the potential dislike. It allows the author’s to use Han Solo and Princess Leia later in the story. For the record Jaxxon happens to be a giant green rabbit. He makes bunny puns throughout the story. The plot of this story isn’t actually all that bad. Overall this annual should be a nice collectible for any Star Wars fan.